'We're moving to your house - the one from your dream'. Siena sees what isn't there; collects what's left behind. 'Lucca led me to his room, and then just stood in the middle, waiting for me to notice something'. Her brother Lucca is three and hasn't spoken for over a year. The doctors think he needs a fresh start, that's why her family left Brooklyn. But their new home feels hauntingly familiar - and when Siena finds an old pen, the story she writes is not her own . . .
Suzanne LaFleur is one of my favourite authors of all time, having captivated me with her debut novel: Love, Aubrey, and nearly everyone knows this. So when i heard she had written another book i jumped at the chance to read it. This book, however, is a bit different to her other ones. It has elements of fantasy in it which have not been introduced into her previous two books, they being just contemporary. I did still like this book but it was probably my lest favourite out of all of them. Maybe because i wasn't used to this style of her writing, but also maybe because i had such high expectations for this book. Thirteen-year-old Sienna has a collection of things left behind or forgotten that she ''rescues'' when she finds them: a hair clip, a toy lamb left on in a park, things of no value that she feels she needs to save, to give them a place to belong. Her parents have just moved house in the hope that her little brother Lucca will get better. He doesn't speak, and no-one knows why. But as Sienna unravels the mystery behind their new house, which is strangely exactly like a house she has dreamed of, she starts to understand that she may know why. 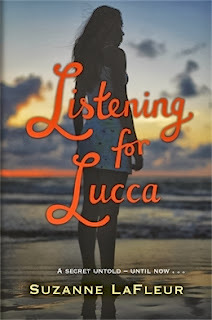 Touching, sad but also uplifting, I found Listening for Lucca to be a short, sweet novel based on family and sibling relationships that is the perfect companion for a rainy day. Maybe not one of my favourite of the authors novels, but definitely not one to pass by. *Thank you to Spinebreakers for sending me this free of charge in exchange for an honest review. Having heard many great things about Kate Maryon's books I was delighted when the author sent me her newest novel, Invisible Girl, for review. (IT'S SIGNED!) and i was not disappointed. The book was quite short, and, because it is aimed at people younger the me, the larger text was such a relief and i whizzed through it in an evening. The world-building was amazing and i automatically felt a part of Gabriella's life as she went from having a roof over her head, to living on the cold, streets, alone. "Most days drift by like clouds. Others burn deep into your life and make a blister, like a bright white moon in a black night sky. And you're left wondering, forever." What do you picture when you think of someone homeless. I imagine an old man, wearing rags, maybe sitting on some newspaper, covering himself with a tatty cardboard box; maybe with a mangy dog sat next to him. You don't think of little kids do you? Well, this book will. It's a reality shock really. That someone as young as Gabriella, and younger, are having to brave life alone because they have such a hard life at home that they'd rather take the chances on the streets. It makes you appreciate the fact that you have a comfortable, loving home and all the things you find ''hard'' in every day life, some people would love to be in your position, because they have it harder. And the worst thing is, Gabriella had to leave her house, because her parent's didn't care enough about her. You always know that even if you do something wrong, eventually, your parents will forgive you, because they love you, right? Well, how would you feel if you knew your parents cared so much about you that they let you live in the streets and didn't car enough to worry about you, would rather live their own life than worry about yours. I only had one slight problem with the book, that being i thought that some of the content was maybe too mature for 9-12 year olds - the age this book is generally aimed at. So i personally think that it should have been aimed at 14 year olds. Overall, I found Invisible Girl to be a thought-provoking read. It makes you question what you think you know, and Kate Maryon has created a main character that readers will be able to empathize with, because of her genuine voice. *Thank you to Kate Maryon for sending me this book for free in exchange for an honest review. 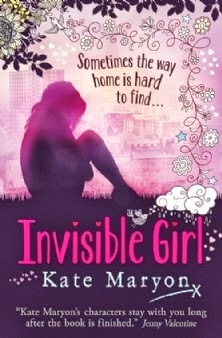 Invisible Girl by Kate Maryon looks absolutely amazing!!!!! I need to read it :) My friend loves all her books so hopefully I'll enjoy them. I loved 'Love, Aubrey' so I'm interested to see if I'd like Listening for Lucca as much. It sounds interesting! I was part of The Invisible Girl Blog Tour and I thought it was a fab novel. I'd never read a book dealing with the topic of homelessness so I found it really eye opening and interesting. A great read. Thanks for the lovely reviews Hawwa. I like the sound of Listening for Lucca so I'm glad you like it, and I must look out for Suzanne LaFleur's other novels. I wasn't really a fan of Invisible Girl - it was good but I think it was just too young for me, being a middle grade novel. Lovely reviews, Hawwa!